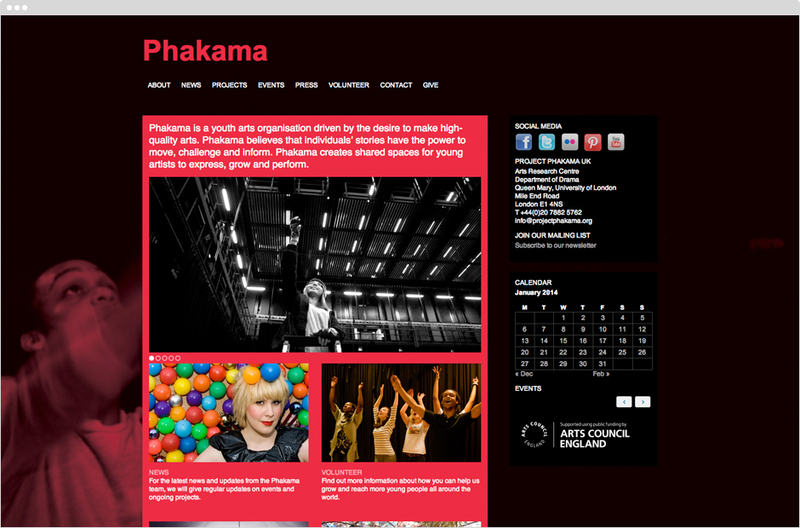 Phakama began as a UK/South Africa arts exchange programme (‘Phakama’ means ‘stand up’, ‘empower yourself’ in Xosa). Based in Queen Mary University of London, Phakama is now an independent charity with projects in Southern Africa, Europe, India and other countries. The Phakama philosophy is best expressed in the phrase ‘give and gain’. Through the medium of the arts, it challenges notions of what theatre is, where it can happen and who can be involved – and engages with diverse communities, institutions and individuals. Our brand identity design for Phakama simply and confidently presents its name, an intriguing and distinctive word both verbally and visually, in a vibrant energetic red. We continued our involvement with the website design.